Entotracheal intubation is a life saving technique used frequently in emergencies and in operation theaters. Hence, the Intubation Indications need to be known to all doctors. For ventilation of the patient: When the patient is unconscious or in a state of apnoea, where he is not breathing, Intubation is required for the proper ventilation of the lungs of the patient. To protect the airway: in several instances the patient has to be intubated to protect his lungs from aspirating either gastric contents or blood. This is useful when the protective airway reflexes like the gag reflex and the cough reflex are absent. For providing Anesthetic gases: General Anesthesia is one of the major indications among all the Intubation Indications. 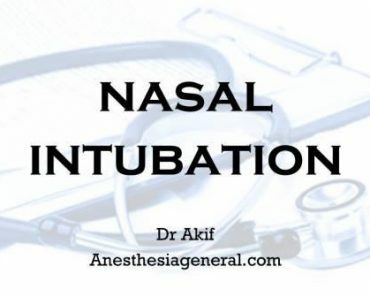 In anesthesia practice, intubation is carried out routinely for the above reasons as well as to affectively administer the mixture of oxygen and the anesthetic gases to the patients in precise concentrations. The Intubation Indications for a nasal intubation are a little different from that of the oral intubation. 1. Obstructing mass in oral cavity. 3. Fracture mandible (mouth opening not possible). 4. Inadequate mouth opening because of temporomandibular joint dysfunction. 5. Neck injury: For cervical spine injury nasal intubation is preferred over oral. 6. For awake intubation, nasal intubation is preferred over oral intubation. 7. When tube is to be kept for prolonged periods in intensive care units (nasal intubation is better tolerated by patient).